New! Handmade Nation on DVD! 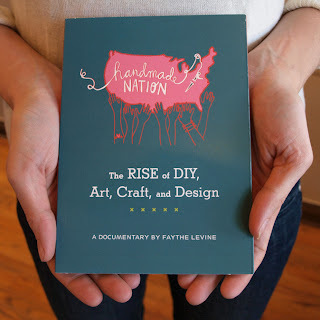 We are so happy to have the Handmade Nation DVD in our hands! This amazing film by Faythe Levine captures the craft-tastic DIY movement sweeping the nation. We were so totally inspired by it last May when we saw it on the big screen and now can't wait to watch it every day! If you didn't get a chance to see it in the theater now is your chance to pick up a copy. 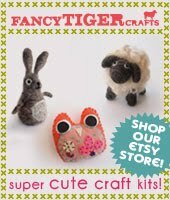 It is now available for purchase at Fancy Tiger Crafts and we give it two thimbles up. 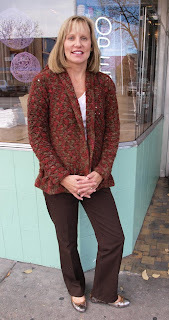 Mary Ann just finished an amazing crocheted jacket out of super soft Malabrigo. What a cozy project for snowy days. So pretty and autumnal! 1) What crafts do you do? I like to sew and crochet. I love yarns--the color and feel of them. 2) Tell us about your project. I made a sweater recently using Malabrigo Chunky yarn with Zach's help. The pattern is from Better Homes and Gardens. 3) How did you learn to crochet? I took a few lessons several years ago at a community school. The instructor got sick and we were unable to to finish the class, so I am also self taught. Thanks Mary Ann! Happy crocheting! New! Melly & Me Sewing Patterns! Now in! 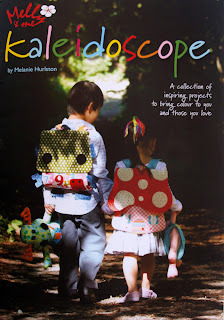 Kaleidoscope by Australian designer Melanie Hurston, a book full of adorable toy and bag sewing patterns for for kids and adults. We love the house and robot backpack pattern featured on the cover. The book also includes patterns for a stuffed unicorn toy, an argyle patchwork quilt and tons more cuteness! 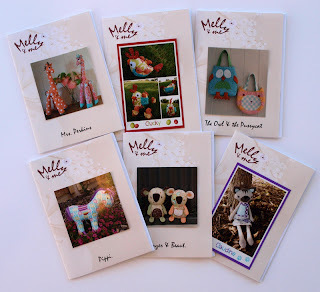 We are also carrying Melanie's individual patterns for bags and toys. Make one for your favorite little cutie. 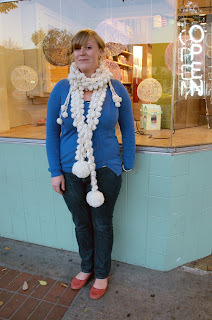 We are totally in awe of Becky's luscious alpaca, pom-pom embellished, crocheted scarf. My-oh-my, it is softer than a unicorn baby. When she wears it she is like a magical creature. 1) What makes you want to be crafty? My main focus is usually on buttons (insert shameless plug here...) but I was raised in a really creative environment so I've always experimented with different crafts such as: embroidery, cross-stitching, anything with googly eyes or feathers, needlefelting, jewelry making, anything I can get my hands on. 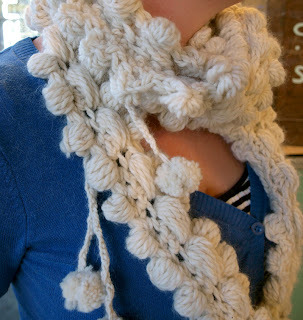 2) Tell us about your crocheted scarf. This was my first time doing the puff stitch and needless to say I got a lot of practice with it. this is crocheted with 100% alpaca and it's super soft. I also got to use various pom-pom makers for the finishing touches. The pattern is from the book Pop Goes Crochet! by Vickie Howell. Zach at Fancy Tiger taught me how to crochet, best class ever. Thanks Zach! New! Spud & Chloë Yarns and Patterns! 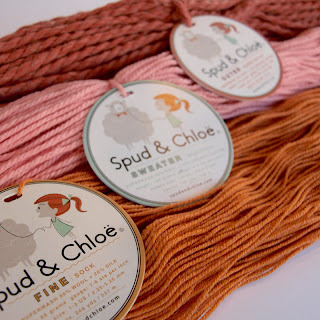 Due to many-a-customer-request we are happy to announce the arrival of Spud & Chloë yarn at Fancy Tiger! 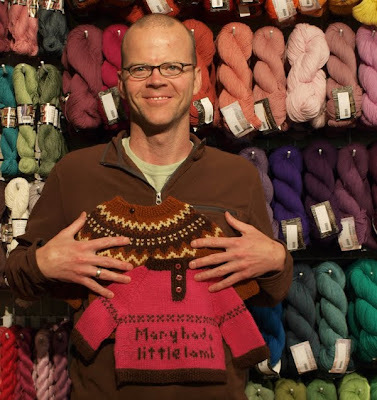 This adorable company makes three yarns. Fine is a sock weight yarn in a blend of silk and soft wool. 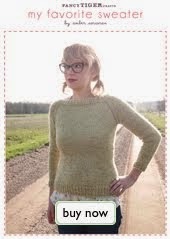 Sweater is a worsted weight and Outer a chunky weight. Sweater and Outer are both a soft blend of wool and organic cotton. All the yarns are washable, so whatever special things you make will be easy to care for. Perfect for gifts projects and babies! 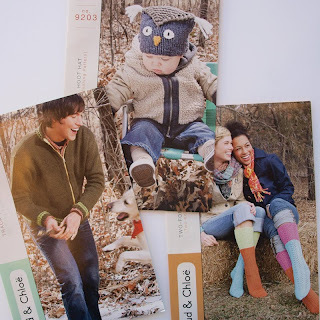 Also in--Spud and Chloë knitting patterns! 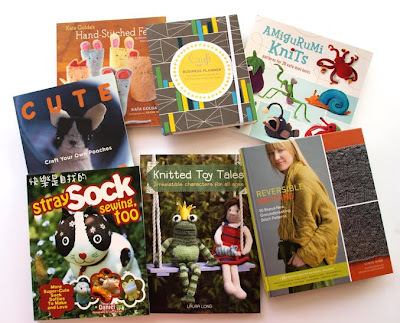 Above are just a few of the many adorable projects we have for Spud & Chloë yarn. Cute! 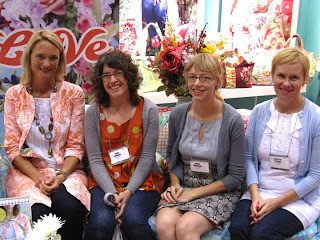 Amber, Christina and I just got back from Houston where we attended the Fall Quilt Market. It was inspiring and exciting and we want to give you a preview for what's to come! 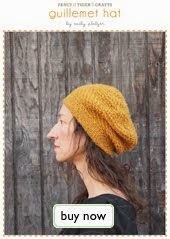 First, we are sooo excited about Anna Maria Horner's new collection coming out this December, Little Folks. 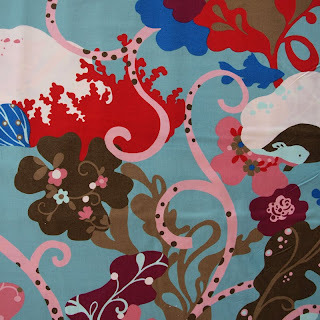 Little Folks continues themes of her last collection, but all the prints are in a fine, soft and drape-y cotton voile. Also, she's doing a line of dobby voile (pictured) and flannel. Anna Maria Horner has a new book coming out next spring titled "Handmade Beginnings" as well as three new sewing patterns! How does she do it?! Amy Butler was her usual sweet self and seems to be super busy with tons of exciting new things. As you know her new collection, Love is out now. 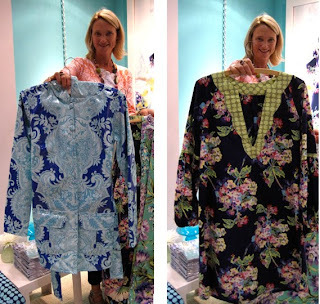 She showed us her new sewing patterns coming out next spring, including a new skirt pattern, two new dresses, a tunic top and a jacket pattern. We really loved her jacket sample done up in the upcoming laminated fabric--cutest raincoat ever! 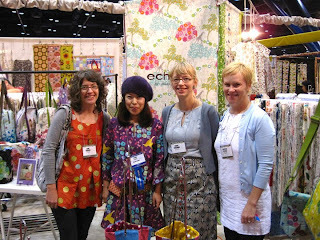 I was so happy to finally meet my all-time favorite fabric designer, Etsuko Furuya, who designs the Echino collection for Kokka. She was adorable in her purple Echino dress. Her newest collection is stunning as always. She showed us some of her handiwork, like patchwork bags she made of her own fabrics and fake fur! 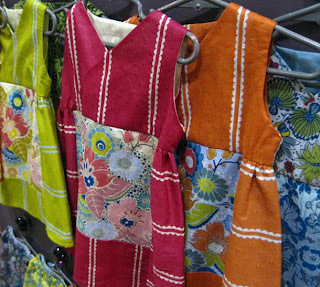 Here is a preview of some of the fabrics sewn up in slippers, bags and pillows. The new Echino collection will be here in January in its entirety. 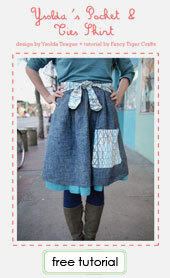 Heather Bailey's new Nicey Jane collection and new sewing patterns! 1) This is their first quilt. 2) It took them just a few weeks from start to finish. 3) How awesome they are. 4) They made it for someone else. 5) The planning stages were all done in centimeters! We've been married for five years and wanted to see if we could accomplish something crafty together. While Anna is usually crafting and Matthew is usually making music, this is our first joint craft project. 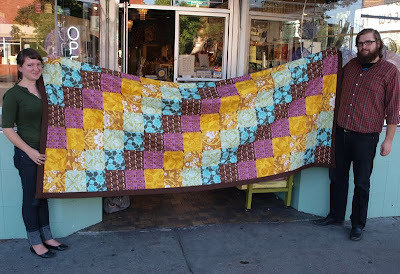 2) Tell us about your quilt. This quilt was brought about as a wedding present for some dear friends. Always a good excuse to craft! My mom made me a quilt for my graduation with this pattern. The colors are peacock based. All our material, down to the cotton batting and the rotary cutter came from Fancy Tiger! 3) How did you learn to quilt? 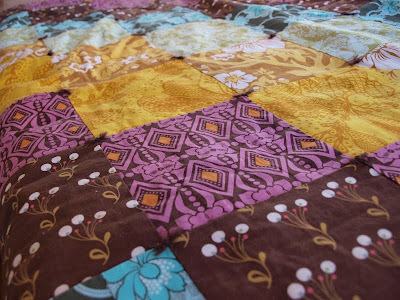 My (Anna's) mom was raised Mennonite so there is much quilting in the family. Patterns and methods have been around me from the beginning, though this is my first "on my own" (with Matthew). Thanks Anna and Matthew! Happy quilting, crafting and music-making! New! Love Collection by Amy Butler! 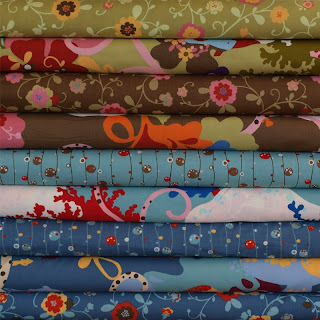 We are so excited to receive Amy Butler's newest line of fabrics, Love! 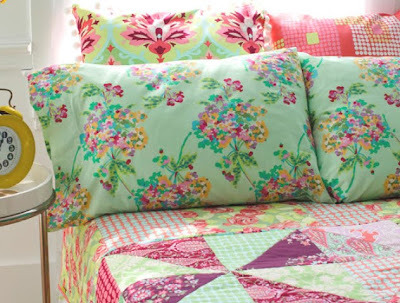 Coming soon--Love's coordinating flannels, home dec and laminated fabrics! Meet my new favorite fall skirt! I just finished sewing up this cute little number, the high-waisted Beignet Skirt by Colette Patterns. I finally used the Amy Butler Imperial Fans print that I've been coveting for a while. The twelve red tagua nut buttons are my favorite part! It makes me feel like such a fancy-pants 1950s lady! Frank, one of our regular customers, is an awesome knitter and a founder of the Mile Guy Knitters, Denver's own knitting club for men. 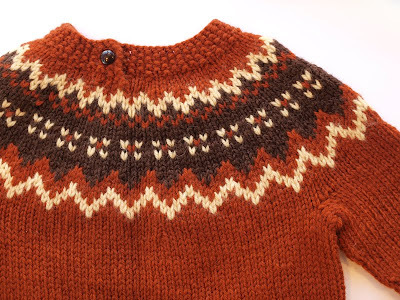 He has been knitting up some adorable children's colorwork sweaters lately. Cuuute! 1) Tell us about what you do. What makes you want to be crafty? I am a law librarian. I like working with my hands and creating. I knit. I like making gifts for my friends having babies. 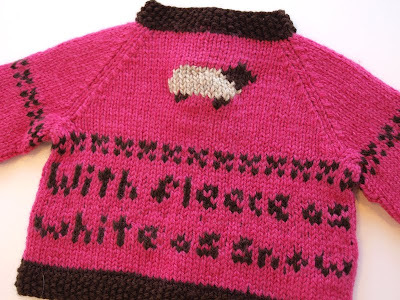 2) Tell us about the adorable sweaters you've made. I've made baby sweaters with Cascade 220 inspired by Icelandic Lopi sweaters. I visited Iceland earlier this summer. 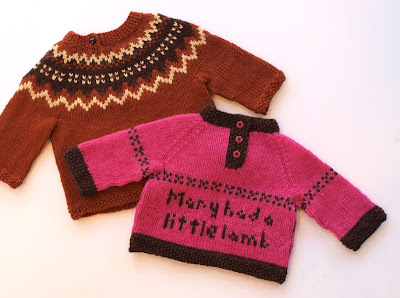 These are based on the Childs Placket Neck Pullover pattern by Joelle Hoverson. I learned six years ago with a book from the library. We loved Momo's last collection, Wonderland, which we sold out of in the blink of a baby pony's eye. We now have her newest collection, Odyssea. It is just as amazing! Several of the prints also come in a laminated fabric which is perfect for sewing waterproof totes, aprons and upholstery projects. Pretty, pretty! Come get yours quick before it is gone! Oh man. 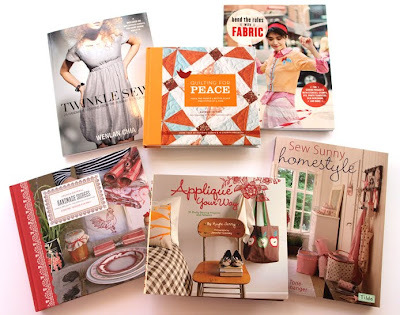 There are so many crafting books coming out this Fall! This is only the beginning and we are already overwhelmed at all of the amazing things we have to make! You may need to stop by and spend some time browsing books this weekend!